This movable, talking alphabet is an engaging, brightly colored and reinforcing app for early spellers. Using device’s built in text to speech capabilities, users can spell the word and have it read aloud by the computer. 1,400 spelling practice questions are included and to make it even more effective, educators can customize the app by creating their own word lists and quizzes! Also available in Spanish. Two versions of this app are available, 7-12th grade and 4-6th grade. Created by a speech-language pathologist, this app helps students to remember definitions for vocabulary words they encounter is their school curriculum. Help your students get invested in their target vocabulary words by adding them to the dictionary. Tar Heel Reader is NOT an app, however, it is a great resource and can be easily incorporated into your iPad using iBooks – a free E-book reader from Apple. Tar Heel Reader is a collection of free, easy to read, and accessible books. 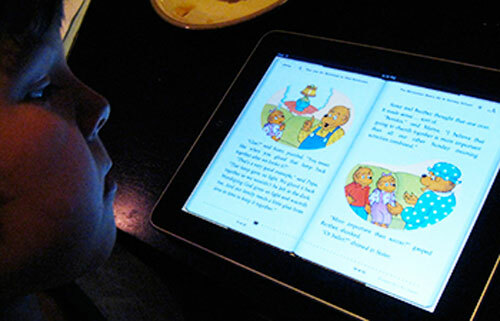 A wonderful resource for children that require alternative access to books (switches, touchscreens, intellikeys), importing Tar Heel Reader books onto your iPad will provide more portable options for students who otherwise must rely on a desktop computer. MimioReading provides Common Core State Standards-aligned lessons to help improve reading comprehension in grades 3-8, and now it’s available on the iPad. According to the company, fifty engaging MimioReading episodes build reading skills in literal, inferential, main idea, and vocabulary comprehension. Here is a new idea that can be great for older students. Using Book Chat, readers can share their opinions, questions and comments about the book’s they’re reading with others across the world. Everyone that reads the book is able to join in on the chat. This may be a good option for students who are intimidated by sharing opinions in a book group but feel comfortable in a more social media platform. According to ASHA, Individuals with reading and writing problems may experience difficulties using language strategically to communicate. Studies have shown that children with language impairments such as dyslexia are four to five times more likely to have difficulties reading than normally developing children. Therefore, reading fluency an important area of treatment for speech and language pathologists. For parents and educators looking for online resources for dyslexia, check out Dyslexia Connect, a tutoring service online for children, teens and adults serving the needs of clients in the U.S., Canada, Australia and the U.K.